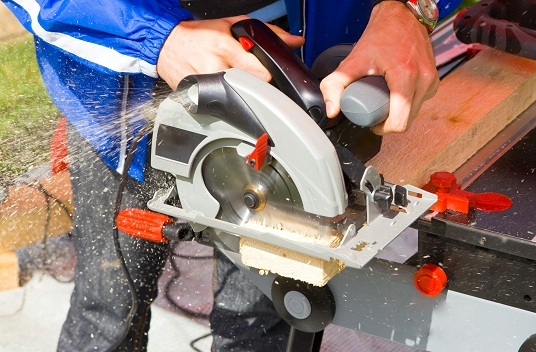 Rotation speed of a circular saw should follow the manufacturer’s recommendations for the specific saw blade. All saw blades are designed for safe use at a maximum number of Revolutions per Minute or RPM”, representing the number of turns in a minute. The manufacturers provide this information on the blade’s packaging, as it is an important piece of safety information. When buying circular saw blades, it is important to ensure that the maximum RPM of the saw which the blade will be attached to is less than the maximum RPM stated on the blade’s package. Non-geared electric motors typically run at 1,725 RPM or 3,450 RPM. Many power tools are direct drive, meaning the blade mounts directly to the motor shaft. In the case of these direct drive tools, such as handheld circular saws (not worm driven), table saws and radial arm saws, this will be the RPM which the blade is operating at. However, there are some circular saws which are not direct drive and operate at different speeds. Worm drive handheld circular saws typically run between 4,000 and 5,000 RPM. Belt driven table saws can also run over 4,000 RPM. Although saws and blades are rated by their RPM, cutting of material isn’t. Cutting type, ripping or crosscutting, is a different story, too. That’s because the RPM of a saw isn’t a good indicator of its cutting speed. If you take two saws, one which has a 7-1/4” blade and the other which has a 10” blade, and run them at the same speed, as measured in RPM, they won’t cut at the same speed. That’s because even though the center of both blades is moving at the same speed, the outer edge of the larger blade is moving faster than the outer edge of the smaller blade. As you can see, regular diameters like 7-1/4″ and 8″ are used within the range of 4,000 to 7,000 RPM. Larger saw blade should run at 3,000 RPM or less. Remember: these are approximate values; true specifications are given by the manufacturer. The reason is why a larger blade can cut through material faster than a smaller blade is a diameter; its outside edge is traveling much faster. Therefore, it is presenting more teeth to the material in a minute than the smaller blade. This is actually the important figure for determining whether a blade is appropriate for a particular type of material. To describe this, we need a more appropriate measurement. The number of feet that the blade rotates in a minute is called “Surface Feet per Minute” or abbreviated as SFM. Let me go over that with you. You start by taking your blade diameter in inches and dividing it by 12, to put it into fractions of a foot. Then you multiply that by Pi, which is 3.14. That number is then multiplied by the RPM of your saw. The answer to that tells you how many SFM (surface feet per minute) your blade is cutting. Don’t confuse this with the speed with which you can move the saw through the material. Just because your table saw blade is cutting at a speed of 4,514 SFM, doesn’t mean that you can move the material that fast. A lot of that movement is outside of the material you are cutting. Not only that, but each pass through the material only removes a miniscule amount as it cuts. SFM for wood cutting is about 5,000 to 8,000, and less than 1,000 for metals. Carbide tipped teeth shouldn’t run at too high values. If two saw blades have equal SFM, you can expect similar results when cutting.